Переводите деньги друзьям, оплачивайте коммуналку и пополняйте мобильный совершенно бесплатно. Кредитный лимит до 100 000 грн с самой низкой процентной ставкой в Украине. Рассрочка, бесплатное пополнение и кешбек до 20%. 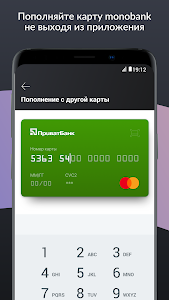 Платите бесконтактно с Google Pay. - Самые выгодные курсы валют: отслеживайте курс доллара и евро, чтобы совершить выгодный обмен. monobank от Universal Bank — первый mobile-only bank в Украине (лицензия НБУ № 92 от 10.10.2011). The first mobile bank without branches in Ukraine! Transfer money to friends, pay bills and replenish mobile absolutely free. Credit limit up to 100 000 UAH with the lowest interest rate in Ukraine. Installment, free deposit and cashback up to 20%. Pay contactlessly with Google Pay. - To open an account, you only need to take a picture of your passport and TIN. - Install the app and answer a couple of questions. - Order the delivery of the card in the desired place and time convenient for you, and when our employee is on the way, he will call you. Show him your passport - and you're done: you have the card. Another card can be picked up at one of the points of issue. - Premium MasterCard ("MasterCard") card is completely black. 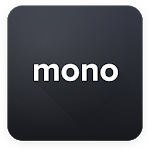 - Chip for secure payments and PayPass for contactless payment. - No need to carry a wallet - take only this card and spend all cash transactions with it. - Grace period, when no interest on the loan is calculated - up to 62 days. - The loan rate is only 3.2%, the lowest in Ukraine. - Top-up cards - for free. - Payment for mobile communications - Kyivstar (Kyivstar), Lifecell (Lifecell), Vodafone (Vodafone, formerly MTS) - utility and budget payments - free of charge even for credit. - Moneybox: get 10% on the balance of personal funds on the card. - Cashback: select 2 categories of expenses for which you will receive cashback this month, and return up to 20% of the purchase amount. No obscure bonuses - only real money in your account! Reduce the cost of shopping without leaving home! - No need to take loans - convenient installment for any purchases. - Select the desired number of payments in the application - and the next purchase will be transferred by installment automatically. - The cost of installments is the lowest in Ukraine: only 1.9% of the purchase amount per month. 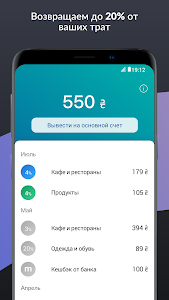 - Personal finance (personal finances): full control and cost accounting for all products in all categories directly in the application: keep track of what you spend the most, and make informed decisions about the family budget. Your income and expenses are in your hands! - Many settings of the card for maximum convenience: changing the PIN code, limits for purchases of goods in online stores, setting the purchase amount, to which you do not need to enter a PIN when paying, and much more. - The most favorable exchange rates: track the dollar and the euro to make a profitable exchange. - You can pay fines for violation of traffic rules online and much more. Human support: around the clock on Facebook, Viber, Telegram and by phone. To withdraw cash, use any ATMs of the country, and you can top up the card in any terminals, for example iBox. Card currency - hryvnia. monobank from Universal Bank is the first mobile-only bank in Ukraine (NBU license No. 92 dated October 10, 2011). Теперь вы можете покупать валюту по самому выгодному курсу через перевод со своей гривневой карты на валютную. Мы добавили архив в разделы «Рассрочка» и «Депозит». Теперь по окончании срока действия услуга будет попадать в архив, чтобы не мешать вам в основном разделе. 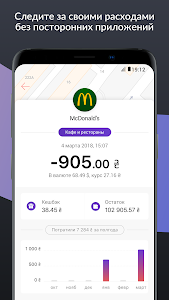 Similar to "monobank — мобильный онлайн банк"